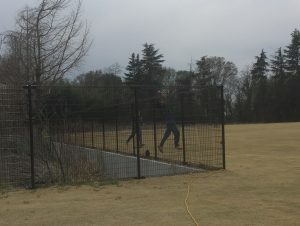 The early season in Japan is all about the fast outfields, and the new Sano International Cricket Ground is proving as rapid as the old river grounds. Opening weekend had some thrilling matches and proves, just as the One Short team expected, that the 2019 season promises to be completely bonkers. Defending Champions MAX CC were up against newly promoted Men in Blue, long time winners of the East Kanto Japan Cup competition but now making their way in the thin air of JCL Division One. 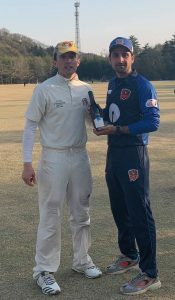 Batting first the MIB had a number of partnerships but were indebted to Gurdeep Dua (55 off 49), who struck five maximums on his way to a maiden Division One half century before having his stumps splattered by new MAX signing Kazumasa Takhashi, who was the pick of the bowlers with 3/36. A total of 218 all out looked competitive at the break, and a lot less so when Hanif Khan (30) and Amigo Kobayashi (55) were going about their business at the top of the order. However Hitesh Akabari’s introduction sparked a collapse of seven wickets for 35 runs as he claimed 4/41 leaving MAX 183/9 and looking dead and buried. 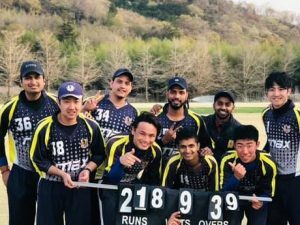 A remarkable last wicket stand of 35 between stalwart Takuro Hagihara (19) and Ankit Panwar (32*) took MAX level with four balls remaining, before Vikash Ranjan sparked wild celebrations by forcing Hagihara to go arial and be caught to secure the tie. If that match was remarkable, then there were even more runs being scored next door on SICG 1 as the Tokyo Wombats and Tigers CC served up a feast. Like MIB, the Wombats won the toss and batted with Alex Patmore (71) and Richie Bracefield (96) putting on an outstanding opening partnership of 172. A typically boisterous 54 from Dan Mee took the Wombats to 247/6 with just Ranjith Mouli (3/24) having anything to celebrate for the Tigers. Last year Wombats twice passed 200 only to still end up on the losing side, but they were confident going into the second innings only to have their hopes melted by a glorious career best 105* by Rahul Koul, which eclipsed his previous JCL best of 63 and will leave him smiling until the season ends. That century, which included six sixes, led the Tigers to a comfortable win by eight wickets, inside 29 overs and left everyone wondering what they might of posted had they batted first. Captain Sabaorish Ravichandran (40*) was surprisingly critical of his team afterwards, saying they were rusty in the field and demanding higher standards if they are to go all the way this year. If they bat like this, they just might. Dhugal Bedingfield LOVES opening weekend. 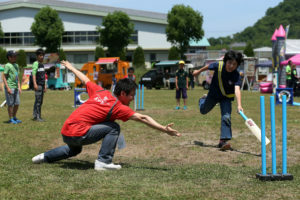 Coming into the Chiba Sharks match against promoted Division Two Champions Tokyo Falcons all you could hear from the Sharks Captain was how he’d scored hundreds on the opening weekend of each of the last two seasons so was bound to do it again…few believed he actually would. 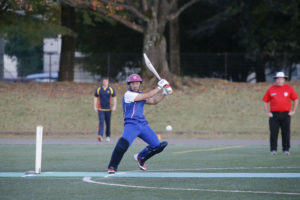 Batting first the Falcons made a decent start to life in Division One as Kuldeep Bisht gave the innings some backbone with a sparkling 73 from 46 balls, but the star of the innings was Chiba Sharks opening bowler Rui Matsumura. The Japan International bagged a career best 5/42 plus two catches, one an absolute screamer on the boundary, to dismiss Falcons for a competitive 219, or so it looked. Bedingfield (124*) and young upstart Neel Date (28) came out to open and a 106-run opening stand set the Sharks on their way. The old warhorse led the charge, bringing up his third Sakura Century to much bat kissing and hugging with his partner Pavethy Velusamy, who finished the game off with a bang to bring up his own half century and finish 52* inside 32 overs to earn a bonus point win by nine wickets for the title hopefuls. Nobody knows quite what to expect from Wyverns this year, and if this performance is anything to go by they are likely to keep teams guessing throughout the season. Batting first against Alpha Quashers, a solid opening stand of 72 between Wataru Miyauchi (41) and Raheel Kano (37) set them on the way to a decent score, before Quashers roared back with four wickets for 19 runs to bring themselves back into the contest. 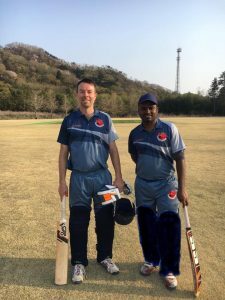 Nozomi Tomizawa (39) was signed from the Chiba Sharks in the off season, and his arrival led to a recovery as he added 76 for the fifth wicket with Bebe Miyaji (37), before a second collapse of six wickets for 18 left Wyverns all out for 186; Devendra Dhaka the pick of the bowlers for AQCC with 3/16 with his left-arm grenades. 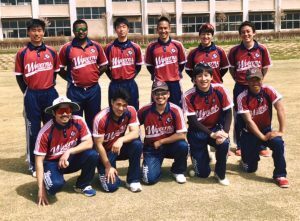 Wyverns then made a terrific start with the ball as Tomizawa (3/15) ripped out the Quashers top order, bowling beautifully in tandem with Kohei Kubota (2/28). At 83/8 it looked like Wyverns had the game won, only for Nikhil Chhajed to make a mockery of his batting position of number eight with a rampaging 62 from 35 deliveries. 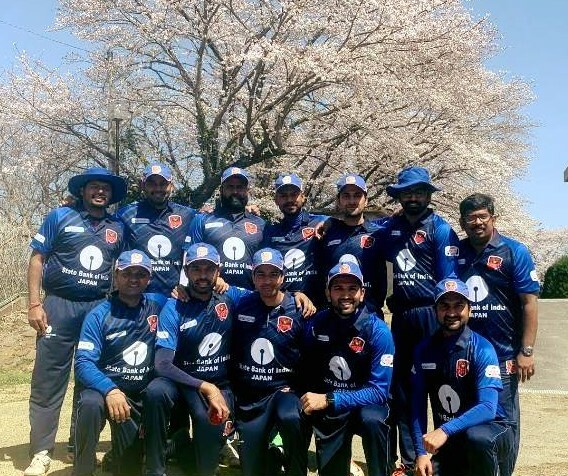 Ably supported by Gurman Singh (25) in a 63-run stand, it looked like the Quashers might sneak home, but a Miyaji floater coaxed a mistake out of Singh and Kubota uprooted Chhajed’s stumps to give Wyverns a win by 12-runs. That wraps up a longer report than usual, purely because of the outstanding performances and breathtaking matches of the opening weekend. Let’s hope the contests remain this good for the season.